"When the cheering stopped, there were... Eight Men Out." 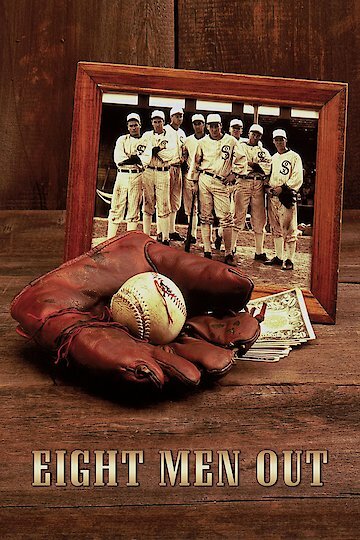 Eight Men Out is the tale of the 1919 World Series that was thrown by the White Sox and Shoeless Joe Jackson. When the World Series was lost by the White Sox, they were termed the Black Sox. The players that were caught betting on the scandal were thrown out of the game, and their lives were altered forever. This is the behind the scenes look at how the people behind the scandal dealt with the scandal before, during and after the scandal, and the movie shows how these people dealt with the scandal on their own. Eight Men Out is currently available to watch free on Tubi TV, The Roku Channel, Pluto TV, Vudu Free and stream, download, buy on demand at Amazon Prime, Tribeca Shortlist, Sling, Vudu, Google Play, iTunes, YouTube VOD online.